Last Saturday W had his first ever day of soccer. He was a bit shy but I managed to get a few good shots. It looks like you have a developing pro on your hands. He doesn't look too shy, but rather very confident about what he's doing. Kachow! He's so into it for such a young age! I love it! Looks like he had a good time. Soccer is awesome. Shaun plays and loves it. Looks like he loved it! Happy WW! He is too stinkin' cute in that soccer uniform. These are great shots! I love his soccer shirt! I remember those first days of soccer, now we practice 4 nights a week and travel all over. So miss those days. How talented! Plus he looks the part. 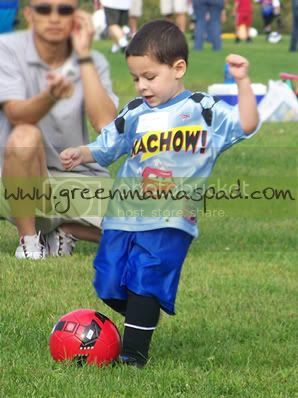 He looks awesome in his soccer outfit! Great pics! He looks like he's working so hard. 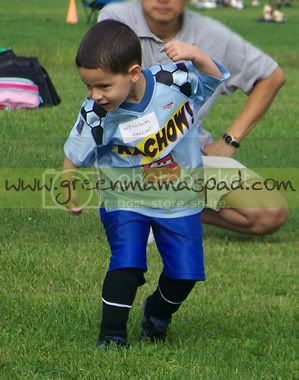 I can't wait until my little guy is old enough for soccer! And, I freaking love his Ka-Chow! shirt. It looks like he is having a blast!! What a keepsake... You know, some of our family got together this weekend and were talking about this same thing. The children playing sports and the emotional parents on the sidelines. Those are some awesome shots, especially the first one. My 4yo loves soccer. Happy WW! Such a great shot! Looks like he was having fun. He is looking good. Great Shots. He looks like he's having so much fun! My 5 year old asked to play soccer next year, I can't wait. How cute is he??? Looks like he is really getting into it! Oh so cute! :) Happy WW to ya! Great pics! He is adorable! Happy WW! aww, I want to come watch! that has to be the cutest soccer uniform ever! Is Kachow the name of his team? That is absolutely adorable!! Graham would love to be a part of that team. What a cutie! How does he like soccer?? Looks like he is having fun. Looks like he'll be a pro! Very cute! Hey, those are really good shots! Well done!